On my calendar I see April 25 which means it is time for a new Rudolp Day challenge. Our challenges are always open 'til the end of that month and your make must be something Christmas related. 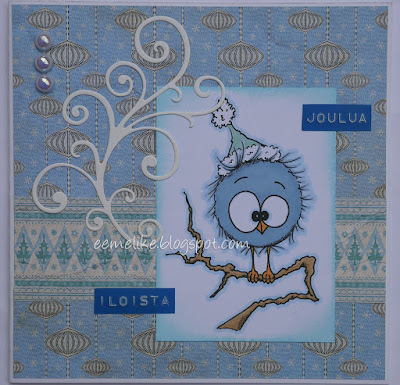 Sentiment, made with Dymo, is in Finnish and saying "Joyful Christmas". Swirl is cut with a Die-namics die out of cardstock that was left out when making card bases. AB shiny flat-back pearls are new purchases. Kalenterissa näkyy päivänä olevan huhtikuun 25, mikä tarkoittaa, että on aika uuden Rudolp Day haasteen. Haasteemme ovat aina voimassa kyseisen kuun loppuun asti, ja mukaan pääset tekemällä jotain jouluista. Super card. Just love this image, SO cute! Ha, ha Eemeli - what a super cute image you used there. And a fabulous card - I love it! Great to see you in the Playground. A lovely card and such a cute image. Like Liz has said - three of us made blue cards for the DT this month - mine and Liz's card even used papers from the same paper pad! what a very lovely Rudolf DT card. that bird is really great, and what a very fab design. This is the cutest little bird! He makes me smile! This is such a cute little birdie and you've set him up so perfectly! Very fun card. Thank so much for joining us this week at CRAFT Challenge! Thanks so much for joining us at CRAFT Challenge - Christmas this week! Beautiful card !! Love the swirl ! I have also become your latest blog follower. This is just so perfect and so pleased you joined us at Craft in our Christmas challenge hope to see you back in the next challenge on thursday. Voi miten ihanat värit, koristeet ja yhdistely! Kortti todellakin minun makuun!! Piristi kylmää keväistäkin aamua! Very cute! Lovely colours too. An adorable card, love the image. Thanks for playing along at AYLI this week.